This is a lesson plan for a counting activity that I did in the fall of 2012. It was intended to support counting within a set of five, as well as numeral recognition 1-5. I made each student a glove with the numbers 1-5 on the pinky-thumb and used them for this activity. This is a lesson plan for a letter hunt activity. It was the kick off to a letter recognition unit that I planned in December of 2012. It includes personal reflections that I wrote about how the lesson went. These were written the afternoon after we completed the activity. The letter hunt kicked off a month long intensive study of letters in which we explored the letters in our room and in our community. Our study placed a particular emphasis on helping students learn to read their own names and those of their peers. By the end of the month, every student learned to read his/her own name. The Inspired Teaching School has a twice yearly event called Intersession. During this week, teachers team up with other teachers to design a four day elective class that focuses on the teachers’ particular interests or talents. Students sign up for the intersessions that most interest them. In February 2013, I co-planned a Musical Theater Intersession with another teacher, Michiko Marron. Together, we explored the roles of singing, acting, and dancing in Musical Theater and practiced our own song for performance. Our class was composed of 20, 3-6 year old students. See the lesson plan for the week below. Based on student interest, we focused our storytelling unit on Heroes. We explored real heroes in our community and in American history. We also explored Superheroes. 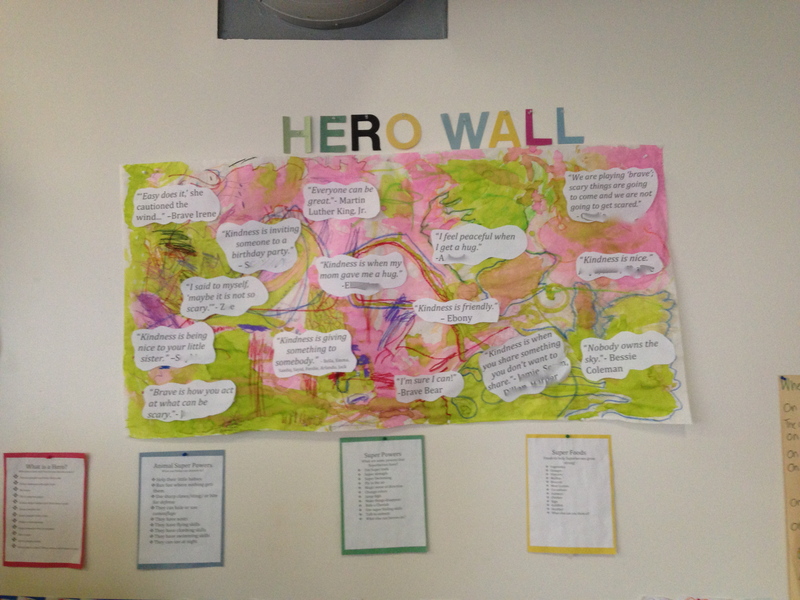 We rewrote our class’s social-emotional development in the frame of heroism. I led students in open-ended discussions about bravery and kindness. We used the students’ words to form a class definition of these words and agreed together that a hero is someone who helps his/her community. The unit included lots of books, storytelling, and counting activities, as well as a focus on animal attributes through the lens of “super powers. We explored heroes from every angle and inserted heroes into every content area. My favorite piece of this uniit, however, was the students’ community building as well as the maturation and increase in self-control that I witnessed in the students as they worked together to define heroism and to help each other live up to these standards. This is a collection of quotations out of class favorite books, as well as ideas shared by students on their ideas of bravery, kindness, and heroism. A daily tradition in our classroom is the sign in question. It began as part of our letter recognition study. I put a daily question with multiple choice answers on the board. 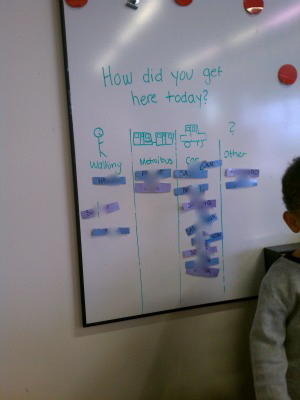 Each student finds a magnet with his/her own name on it and moves his/her name to the answer of his/her choice. Through this, children have learned to discriminate their own names from their peers. They have also learned how to read each others’ names, and use this skill to track their friends’ answers. The questions always include both text and drawings to help support children’s understandings of the answer choices. 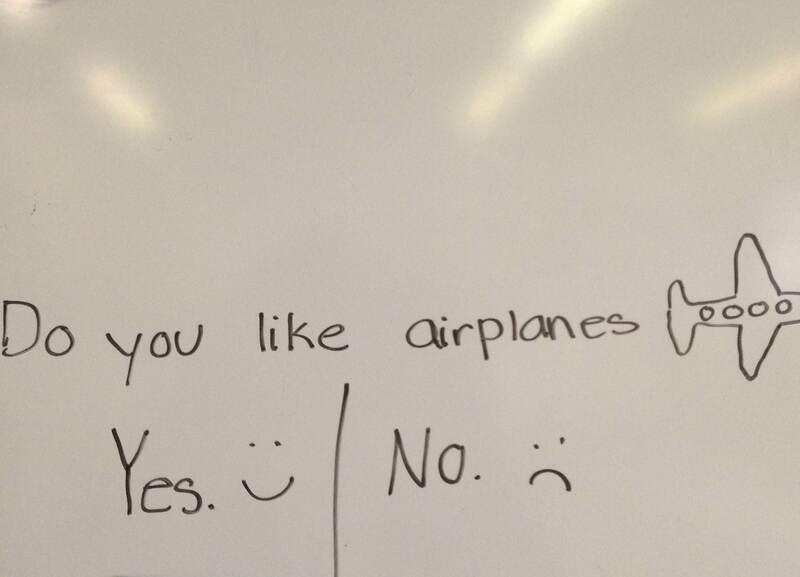 Recently, students have begun coming up with their own questions to ask each other. One of our first sign-in questions. Names blurred to protect students’ privacy. For more information on the contexts in which these lessons and traditions occurred, please see my Curriculum Page.